Shop sale at CampingWorld.com for up to 75% off top products. 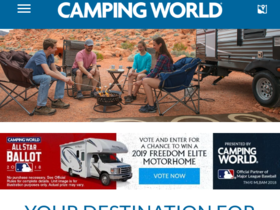 Sign up for the Camping World Visa to earn up to $60. Club members can enjoy free shipping on all orders from CampingWorld.com. Enjoy free shipping on orders of $49+ from CampingWorld.com. Check out Camping World online for their latest special offers.